Explore the intricate temples and gardens of Kyoto on this 4-hour guided tour from Osaka to visit some of the imperial city’s most important religious and cultural sites. 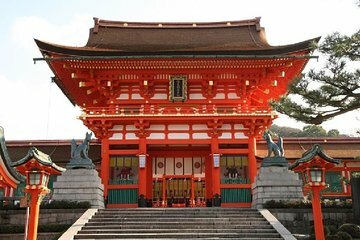 Check out Sanjusangendo Temple, home to more than 1000 statues, the elegant gardens of Fushimiinari Taisha Shrine and the supreme views from the UNESCO World Heritage-listed Kiyomizu Temple high above Kyoto. This excursion to Kyoto’s top temples also includes round-trip transport from select Osaka hotels, a guide and all entrance fees. See the most picturesque temples and beautiful gardens that Kyoto has to offer on this 4-hour afternoon tour from Osaka with a guide, stopping at some of the city’s most significant religious monuments. Gain new insight into the traditions of ancient Japan and get plenty of photo-taking opportunities as you visit a selection of its beautiful temples and shrines. Begin your tour with a pickup from your guide at select hotels in Osaka around midday (please view Important Info for more details), continuing on to Osaka station for your rail journey to Kyoto. Climb aboard your included JR rapid service train for the trip to Kyoto station, where you’ll disembark and make a short walk to the city’s nearby New Miyako Hotel to connect with your coach bus. Start your Kyoto exploration by heading to the visually-striking Fushimiinari Taisha Shrine, a wildly colorful building bearing bright-red columns and a green roof. The interior of this beautiful structure is perhaps even more impressive, harboring a series of immaculate gardens and placid ponds. Continue next to Sanjusangendo Temple on the eastern edge of Kyoto. This beautiful religious site, home to 1,001 statues of the Bodhisattva and built in the 13th century, is famous for being the longest wooden building in the entire country, spanning more than 394 feet (120m) in length. Spend around 30 minutes checking out this impressive temple before boarding your bus for the next stop. Proceed next to the famous Kiyomizu Temple, stopping to browse the rows of pottery stores that line the streets leading up to the site. This elegant UNESCO World Heritage site, originally build in the 8th century, offers panoramic views of Kyoto and the surrounding area from its spacious terrace among the wooded hills and nearby Otowa waterfall. Finish your Kyoto experience with a trip on the JR rail back to Osaka station, where you’ll make your own way back to your hotel. The places we visited were ok, but it was really stressful for us, bec from pick up pt we have been walking from difft train stations to another. The guide who picked us up was also rude, saying we should not join the tour if we have any complaints. We will not get tour from sunrise anymore. Too much time spent on picking up customers at too many locations. Service is excellent. Bus comfortable. Tour quide speaks good English and helpful. Very interesting took lots of photos thoroughly enjoyable tour guide Saiko very knowledgable and friendly. This tour was great. We saw two of the most amazing temples. Only complaint would be I would have liked a little more free time to look around the amazing market at the Kiyomizu Temple. My sister and I went together and thoroughly enjoyed ourselves and the sights. Our only irritation, really, was the other tourists that came on the trip, who, at times, insisted on trying to add their own 2 cents to the tour with ignorant or thoughtless comments. But besides that, what really sold the tour for me was the personal guide that we got that got us from Osaka station to Kyoto. Because she had no other tourists to guide to Kyoto, we got some face-time with her and really learned a lot about Japan just by her openness and friendliness. All in all, I'd definitely do another tour through Viator.